The rules: List your scrappy budget for the whole month. Then list the high priority items that you want to buy this month! Tell us how much you spend throughout the month, and keep track of it as you spend. We like details about your shopping around here. No such thing as TMI! You do not have to include costs for adhesives, swaps, storage, gifts or shipping, unless you want to. Please round to the nearest dollar value. Maria - $25-10 = $15 - 75 = BUST! Amanda - $0 before 100 pages! Sharon - $25 - 27 = BUST! Linda - $0 - 15 = BUST! Happily! Janeen - $0 until 3/23, then $150 - Disney goodies - 170? = BUST! but it's under protest due to the sheer volume of scrapping you've done! Edited by SonjaC on 03-27-19 09:15 AM. Reason for edit: No reason given. I'm in with a $25 limit again this month. Budget: $35.00 plus my birthday $25.00. Wish: Nothing, I think I bought it all today. Of course, I'm in. My budget is $20-25. I did order some re-inkers, which won't be in for a few more days; think I'll wait until the end of the month to pick them up. Thanks for hosting Sonja! And I am so proud of you and wow Julie - did you ever believe you could go two months!. I am going to say £200 but I doubt I will spend anything near that if at all but we will see. that has always been the rule Kelly! 0 for me - still not at 100 pages! A whirl wind day...hubbies birthday with all the kids and grand-kiddos here plus 3 dogs and 2 cats. DS 1 fumigated their house since they were going to be gone the 4 hours required. budget - should be $0 but we know how that goes for me. $25 as we are going to start building a new house at the end of the month and I will need every little penny I can muster plus more!!! Nothing spent yet but finally got into my craft room to start cleaning up and organizing. Made a card and that is all. Love the new loophole I learned of with buying before posting! Gotta remember that one for next month! Sharon, What a wonderful day and yikes on building a new house! Where are you going? Im in with a zone budget again. We just booked a Easter cruise so saving money for that. Day three and my budget is still intact. Whoo-hoo! Happy B-Day Kelly!!! Hope you have an awesome day!!! Are you still luvin your Peloton? I can't believe I was at crop and bought $0 scrap tools. However, I did buy an awesome T-shirt for $5 with bubble quote "You never know what you have until you clean your craft room." So since I got a new printer that prints on 12 x 12 cardstock, I need to rearrange my work stations. OOHH can't wait to see what I find! All day at crop and got no pages of baby album done. But, I did get 6 layouts and 4 cards made. Sharon - So excited for you to start construction!! I'm sure your first priority was getting your scraproom designed! Almost forgot my budget - $0. I figure that after I rearrange my "studio" I'll have so many new things I'll end up with a store credit. And with the temps dropping down to 20s again this week, my happy self isn't planning on going anywhere. I'm in again too...my budget is $0 until the 23rd when I go scrapbook shopping with a friend. Then I'm giving myself $150 to shop. That is basically my spring break fun so it should be a cheap spring break. I really don't NEED anything, but I do want several of the Disney themed collections that Simple Stories just released. Hoping to find a few of them when I go shopping. Still trying to stash bust although I haven't done so well in February...need to bust out the oldies but goodies and make them new again! I did not see that Tammy and Janeen!!! Okay I think I updated the top enough. You all are rather vague with your budgets... I put $50 for me, but I am really going to try not to spend that. And no, if you spent it before you check in, it doesn't count. I think that was a Kelly-initiated loophole from years ago. So the $4 I spent at Ms on Saturday doesn't count either... Got some cute Jillibean Soup wood embellies pack below at half price! I really wanted the shaker card kit and stamps too, but had to resist as I only had one coupon. Edited by SonjaC on 03-05-19 11:16 AM. Reason for edit: No reason given. Almost busted I have my cart full of goodies, But I was a good girl and didn't check out. No looking no buying no spending......but we know how fast that can change! Then I got a coupon for 60% off today at Ms and I went and got me the Jillibean mason jar set - both stamps and cards and a washi pack I've been searching for forever. Ms sells the shaker inserts and the cards together for $10. Everything was on sale AND 25% off on top of that. Total spent $13 - total saved $15! So there! Oh Sonja, I'd not be sorry either! You got some pretty stuff! Edited by Ladybing Tammy on 03-08-19 12:07 PM. Reason for edit: No reason given. Tammy I'm totally willing to help you spend that quota.... It's a sacrifice I will make for you! Going strong so far but with a crop coming up in two weeks.....well I already have things on order but none of it scrapping. More monthly blocks for my Home sign.. I've not spent at all thus far. Got in my goodies from last month and loving them. I'm on vacation this week so if I can, I'll venture out to one of our LSSs. Went cropping last night and got 3 LO's mostly done. Julia... did you push the button yet??? Crop was a blast, but my normal vendor wasn't there so spent $0. Had to buy tags for baby album - but since that $2 was for a gift, I'm still at $0 spend. New job is fabulous!!!!! My "Studio" makover is going great and decided I need another piece from Ikea. Now to figure out when I'll have time to get there. I did pick up a deep shadowbox frame for my heritage hall wall at Ms during a quick stop to get gas during lunch. No time to shop. Went to M's for letter stickers for a LO I'm working on and found a bin of washi tape for $.33 each. I bought several and spent $9.94 total. Decided yesterday afternoon to go for another crop weekend next weekend. It will be low cost and l'll be going with 2 of my besties. Can't wait! I'm living vicariously through everyone elses shopping sprees. I have been so sick, I haven't been able to shop. Do you know how sad that is? Anyway, I'm feeling much better today. I have finally turned the corner. However my budget is safe. I have some crafting that needs to get done, so that will keep me out of trouble for a bit. Kelly, I had wondered why you were being so quiet... I figured it was because there was not shopping going on, did not realize it would be no shopping because of sickness. Glad you are on the mend and with projects that need doing to keep you out of trouble. so sorry to hear you were sick Kelly but glad you have turned the corner. Kelly - glad you're feeling better. The flu was going around the office past 2 weeks. I think I dodged that bullet. Kelly, I am glad you are feeling better. The sickness stuff this year is no joke. I am a teacher and we have had so many kids out for a week or more. Ugh! Thanks everyone. I'm feeling so much better today. Still haven't purchased anything, and I've done a ton of crafting; so I'm feeling pretty good about myself. Looking at new stuff here, have several in my cart...no buying tho. Have another week before the crop so I want to save my pennies for that. Linda, how did I miss you getting a new job?? I know you have been looking for ages but did not realize you found a new one. Now that you have a better budget you have not time to shop. Kelly, hope you are still improving! I am sooo proud of you Sharon! Just checking in. Kelly, sorry you were sick and hope it keeps getting better. I've been around a lot of people who have a lingering cough. Waving hi to everyone . DH and I went into NYC a couple of days ago just to have lunch, walk the highline park and take in a museum. It was a nice day and we really enjoyed it. We are on a staycation but did want to go for a couple of day trips. No more scrap shopping has taken place since earlier this week. My friends and I plan to hit up a HL on our way to our crop next weekend. Sharon - no time for shopping is the least of MY time issues. What was I thinking when I waited until I had a job to redo my scrap room - oh yea - no budget I'm dedicating an hour a day to re-scanning my printed photos in case I have another laptop crash issue - not a fan of this Dell. My new Canon Pixma TS9521C Crafter's wide-printer is the bomb! Now I have to find time to learn how to do the Cricut Print and Cut on my cardstock That was my present to myself for getting a job, not clothes, nails, hair - but something really important that I'll use all the time. Thank goodness I have my priorities in the right order! A vendor was closing shop at benefit crop. $5 very well spent! So here's some inspiration for everyone! Sue - hope everything is okay with you. Linda - love the shirt! Hope everyone is having a great weekend - mine is almost over. I am agonizing over whether to spend or not to make my quota this month or go into pending next month and maybe see something in preorder I want to get out - but there usually isn't too much in the preorder that I like...sigh...maybe I will just get my inks that I need to complete my collection of new ink pads. So my list of errands went right out the window. No trip to IKEA since there's a Boston Marathon qualifying race this morning and ATL United Home Game/Tailgating. REALLY wanted to get additional Alex pieces, but that will have to wait until next weekend. Decided to "Test Drive" how desk and drawers are rearranged before bringing in and putting away everything else. So glad I've got an extra room where everything else is along the wall - easy to see and get to -oh but what a mess to look at. I had also thought of investing in IKEAs Skadis pegboard system, but don't know if I want the wall covered in the boards and items. I'd have to take some of my tools/supplies to make sure they fit IN the containers and trays since IKEA doesn't give inside dimensions. btw the new gutters look beautiful and love that you can't see the re-positioned downspouts. Linda, glad all is going well with you. Sounds like your house is coming right along. Pictures requested when your new space is done. I do not think I would like a peg board type storage...I think it would look too messy all the time!! Although probably better than my messy desk!!! No spending here, in fact I am cleaning out with a pile of trash and a pile to take to share at the crop. Just the beginning but at least a start!! I did find some things that I was wondering what had happened to them, like some metal sheets that I was wanting to use in one of my new embossing folders!! I just looked, the same 5 items are still in my cart and 3 of them are out of stock and the other 2 I am not that eager to have!! Guess I won't be ordering any time soon. Good for the budget! Good Morning! No spending this weekend. I spent the weekend doing a chapter in Math and took the test a week early! This leaves me free to crop next weekend without guilt and anxiety (my 2 closest friends ). Tammy, quotas are a Pita but it will be nice to have your inks complete. Linda, you are fun! Love the shirt! It is tough to organize and re-organize cause needs change over time. For me, it's all about the reach. I'm only 5'2" so anything too tall may as well be in outer space. A peg board would be no use to me as I'd have to stand to reach across the desk to get something and then my sweater would pick up random stickers off the desk top and I'd knock over and spill my coffee cup . Sharon, that is what happened to me last month. Decided I really did not need what I had in there but then something came back in stock and I went for it. Linda, that shirt is cute! Still nothing over here, but Catherine Pooler has a release next week which may in fact bust my budget. Still not convinced on the inks or anything else for that matter. Travelling tomorrow through Thursday for work so may not get online. No spending yet for me, no withdrawal or anything!! Friday Saturday and Sunday will be the test as I will be at a LSS crop. Glad we are having a no spend month, for the most part...makes me nervous to see what happens the last days of the month. Linda, I am so glad you enticed me to start cleaning my scrap room with your lovely sweatshirt...I found some thing, quite by accident that I needed to send to my sister. Nothing scrapping related which makes it a more important find as I never would have located it if I had been looking. Wish I remember where I set it now!!!! whew, found it again. It was a brass nut assembly that goes with a brass ships wheel that came off of the first motorized boat that ran the lake of my home town. A great uncle was the "captain" ....my dad ended up with the wheels off of a couple of boats his uncle built, then they came to me. I have had them for years and gave them to my sister to display after she bought a historical craftsman home in our hometown 18 months ago... after a visit in 2017. We had gone back home with my mother remains for a memorial service, stayed in the area for two weeks and thought we would go back often to visit as my husband and I still have relatives there. Due to my husbands medical needs we will not be traveling much, if at all. A huge old oak tree fell on the house my sister bought.....now with the repairs done my sister and BIL have decided to sell the house this summer and will be donating the wheels to the town historical society. I will be sad to see the house sold but our plans to visit often and stay the summers just are not feasible any longer. More information that you wanted to know about my find in my craft-room closet!!! Maria - PLZ - You're taller than me! But then again, my goal when growing up was to be taller than my abuela and mother - Mission Accomplished! I guess I should have taken pic of me at crop covered with paper scraps. The static electricity in that shirt was like being connected to an electric magnet. I think I'm going to go with more IKEA Alex drawers - low to the ground and LOTS of countertop areas for my Big Shots, and pretty mermaid boxes. The trunk one now holds my stamps and large flap box holds all my glimmer mists. I think I'd store my paper pads in the Alex drawers and free up cubes in my Kallax for unfinished albums. Sharon - Have fun at LSS this weekend. Mine closed a couple weeks ago and I'm so missing it. I'm so glad you found the missing piece! The historical society will definitely treasure your donations. You should include a few scrap pages about your family connection to this piece of community history. And don't forget to document the donation event!!!! It's so important to preserve the items and moments and that they find a good home - even if it isn't yours. I think you should send your grandkids up there so they can be part of the moment and getting a sense of belonging while learning more of their family history. I've enjoyed my jaunts over the past few years visiting places that family have been and being surprised by historical events connected to my family. It's kind of like cleaning your scrap room - no telling what treasures you'll find. It just feels so different when I went to the Smithsonian with the kids ages ago, from when I went back after meeting member of the Harney Historical Society, given list of items his widow donated to the Smithsonian, and then getting a tour with Dr. David Smith to actually touch items in archives and see other items on display for all the world to see! I can just picture your grandkids taking their grandkids back to your home town and having that same star-struck feeling. It definitely puts a different spin on History class! So if everyone gets a nickel for each word I just posted, ya'll should have some free money added to your budgets lol!! We are a boring bunch this month! No spending going on here!! I'm not even doing much scraping!! Found a book that I am enjoying! We definitely are a boring bunch! I may or may not have much to report this weekend. There will be no vendors but we are planning a stop or 2 along the way. Nothing I need or even want right now. Linda, LOL on you beating your Abuela and Mother in height. My DD is a 1/4 inch shorter than me (for now) so I am happy about that. Sharon, what book are you reading? As Tammy asked about me, decided I should poke my nose in. No spending at all this month from me, either. Had some major 'stuff' occur, and I am dealing with the after affects (or is that 'effects'?). Here I was hoping to get that re-inker I really want. Seeing as we are talking about height: I am also 5' 2". My mom was 5' 5", lost 3 inches due to osteoporosis (lower back compression fracture). Maternal Gram was also 5' 2", the tallest of 3 girls. What gets me is: last time I went into my GP, the fool's office help is saying I am 4' 11 1/2"! My. Sweet. Aunt. I've tinkered around with some possible layouts, so I am happy. Glad we're all having fun being vertically challenged! I was so inspired by the beautiful die cuts I got in Laura's swap a couple moths back. I'm having a hard time using some of them because they're just toooo beautiful. I'm spending so much time trying to spend my money and find some of those beautiful corner and/or pocket dies, but everyone I find is "No Longer Available". Off to a weekend crop this morning. Hoping I packed the right stuff. I have about 14 kits prepared but they are sparse. Was not going to bring my rolling tote then decided to take it after all. Not sure how the budget will fare today. Depends on where we stop on the way. My scrap room is a mess! Hello all - I have been travelling for work but am home now. Sue - hugs, I hope things go better for you. BAD Kelly!! Sending me your cold.... Kidding! But I was down for the count for the first four days this past week after an extremely busy week last week. OMG I barely got out of bed for two days! It was awful! Turned out it was strep throat and thankfully my parents were here and able to whisk the kids away before the plague hit them. Hubs did a decent job as caregiver for a change and I'm on the mend now. I did craft tho the last day I stayed home and made some cards with those shaker packs I got. I LOOOOVE them!!! I want more.... *slaps hand* NO! LINDA!!! Love that shirt! Made me giggle! And I agree, that's a very good loophole! LOL! Janeen, downtime is my worst enemy, though it didn't hit me this week while sick. I read four books and made three cards. And 73 layouts in the first 3 months of the year.... Personally that's a loophole right there. I say you didn't bust, we'll just sweep that $60 under the rug and call it even! *slams gavel* NEXT! Sharon, I know the feeling... I was tempted yesterday by the scrapbook.com 50% off items. I have four stamp packs I really want to get, but managed to talk myself off the ledge (for now). Suebird, I went to the doctor last week and learned I've shrunk an inch! I'm 5'3.5" now! I thought I had at least another 10 years before that started happening!! Short girls ROCK tho! Glad you had a fun crop, Maria! The banners for the G45s keeping popping up. PLZ stop teasing me. Got a busy night of MORE soccer games. 2 games played (and won) so far and one more tonight. Let's see if I can make it 3 in a row and get my very own hat trick. Tammy - my grandson still calls hubby Blalo. It's so cute coming from a college kid. yes I can imagine Linda - I love the spanish language - so wonderful. Back from my crop and got 9 pages done. I need to add some finishing touches on a couple before I post and put in albums. I did do a bit of shopping and will have to estimate but I did blow the budget a little. Spent about $35 at HL on a small embellishment tote and stickers. Then went to M's cause I had a 60% off coupon plus 20% entire purchase. Got a mini-battery Ott lite for crops and another sticker pack for a LO I was working on and spent another $30 there. So with the $10 I spent earlier this month, I've spent a total of $75 and that should close me out. Sonja - Agreed...TM seems to be my downfall these days! At least I am scrapping TONS so I can feel like I am at least using stuff. I headed out to the scrappy stores and I am happy to say that I only went $20 over my budget. Most of what I got was on my wish list and I got tons of fun new goodies that will be perfect for scrapping Disney which is a plus. I stayed away from paper just because it was "pretty" and if I loved the colors or designs I just bought 2-3 sheets from the collection. I am placing a small order here to get a few of the embellishments for the Simple Stories collections that I want and a few papers to hopefully use up the embellishments from an old Hip Kit Club kit. Plus I'm on spring break all week so let the scrapping commence!!! Back from my crop too but mine was a bust for the most part, I did not get any pages done in fact I did not even get them out of the car. Worked on a different project... I was there for only 4 hours. I was not feeling in the scrappy mood. Too many things going on and as you know I scrap quite a bit at home so no loss. In fact the crop is so inexpensive that I can afford to not go if it just does not work out. The most expensive part is the shopping while there!!! I think I was saved from busting by the owner of the shop! She came and took back something I bought to sell to someone else!!! As you can image it was not something I needed and she had ordered it for someone else. It was displayed in the store for sale and I like it (G45) so I picked it up, along with a few other items. Sherri did order me another pad (which I don't really need anyway) and I forgot to check to see if it was added in or taken off my purchases for the week end. So I still may have busted, $27 spent. You will have to admit that is the lowest expenditure for a month a long time!! wow Sharon - well done! and was it that wonderful G45 Bloom? That is the collection Tammy!! It will be next month now that I get it. Sharon- yep that's one of the packs that keep popping up on my screen. And can you believe now I'm also seeing that OH TOO CUTE new Authentique Pad! Both of them may just end up in my cart and then I'll get free ship. Made it to Ikea late yesterday to get myself another Alex - what a bust! There is NO Way those drawer bottoms will not warp or break if I even thought of putting the weight of my paper pads flat. I couldn't imaging them holding my punch collection either. Hubby was adamant that there was no way we were taking one home. Also checked out the 2 desk shelf options, but they're not deep enough to hold my printer and the drawers only came out half way - WHAT???? Spent time checking out the Skadis (peg board) system and the trays aren't deep enough to keep everything from falling out if bumped or taken off the board. Well at least I saved a ton of money and hours assembling everything, and lots of time being upset. They do have a Kallax style that is a mix of sizes, but then again, I don't want to SEE everything. Guess the stacks are staying in the other room for now. I'll let ya'll know if I cave and hit the checkout button. Yea me - I didn't cave. Decided to work on a project and stay off-line and away from temptation. Today was a different matter - went to look at kitchen sink rugs on sale at TMs. I was SOOOO good until I walked to check out and saw an old Spellbinders Nestabilities set that I'v wanted forever and behind it was a gorgeous Firefly Butterfly die and stamps set (perfect for tag swap project). I did pass on all the beautiful Tattered Angel mists, but blew it when I saw another TH tag stencil set that would make great background with my butterflies. Sharon, you did well for the $27 you spent. Linda, good deal! I can't wait to go to TM again... I live 2.5 hours away from one so have to make it on a trip as I go to visit DD. I just some (surprise)... PAPER! in my cart. Saw the ad for Shimelle's Sparkle City. I was l choosing individual sheets but liked so many, that I decided I'll wait for the 12 x12 to come in. Also digging the 2 Canoe paper called Saturday Afternoon. Looking forward to the end of June when classes are over and I can enjoy some lazy weekends at the lake. Talk to me about stamp storage, y'all... I have SOOOO many unmounted cling stamps and NO where to store them. I was storing them in a zipper binder with page protector sleeves, but it isn't practical (and it's full). I have four clear storage trays like the totally tiffany one below, but they've gotten damaged in transit and are cumbersome at best. 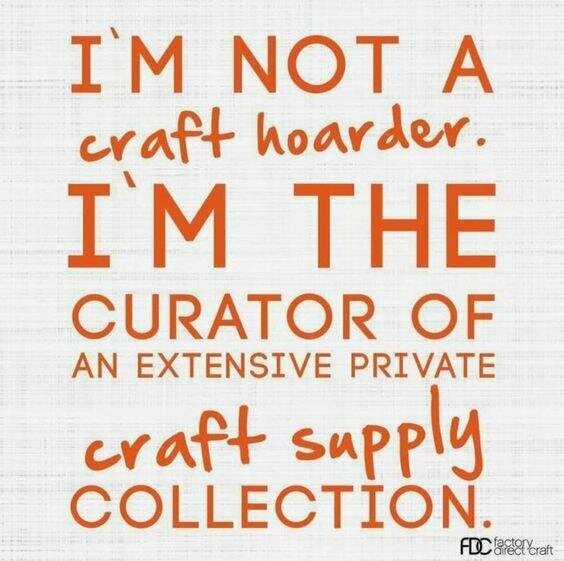 Was looking at these Crafter's companions below or the Tim Holtz storage binder system. Any thoughts? Not a very good picture but this is how I store my stamps. I have gotten another clear plastic bin since and did away with the white one. I have also purged my stamps til I have only the ones I actually use! The rest are on their clear sheets then in a clear envelope (Avery elle ss-5001 stamp & die storage) with Julie Nutting in their original packaging. I like having mine stored vertically on a shelf which makes it easy for me to flip thru them. I do not take them out of the house unless I take a few in kits I have made up. The green things separate them into themes but I am not very good at keeping them in the proper place!!! Janeen, you said you had a budget of $150 after the 23rd. On the 25th you mentioned you went over budget by $20. So that was a total of $170 spent? I'm still protesting that initial $60 due to sheer volume of your scrapping. Also... how is it I started out the spending haze, but have not busted AND Kelly has birthday money and SHE hasn't spent at all? Or is she hiding??? Tammy, don't you have a quota to make? I found my receipt from the crop and did have to pay a deposit for that pad that was ordered for me...remember the one that the hostess came and took back because she had ordered it for someone else and another person sold it to me!!! Anyway I spent $37 this month with that $10 deposit. Still all in all a good savings month for me. Yes $170 was my total. But I do have some stuff in a cart I'm probably getting today so I am definitely busted. I'll let you know my total once I hit buy. And I've done several more layouts and am now at 80 layouts since January...at least I'm using stuff up! Poking my beak in again. Haven't spent a dime on anything. Of course, it's due to the 'unforseen problems', and resulting fall out, etc. Had to get things sorted out for that, and the mood I was in? Especially didn't feel like shopping. Sonja, what gets me about the height bit: The Moose is 6' 6"; hasn't changed, keeps hitting the light in the hall (you think after 20 years he'd learn). Said light is 18 inches from ceiling. I still got the same dang spot on him. Thus, I think the doc is a quack. Have gotten some work done on various layouts, which is good. Edited by suebird on 03-28-19 11:32 AM. Reason for edit: No reason given. lol - I am visually your Moose continually hitting that light! Sorry but it is funny from where I am sitting Sue. Sonja, yes I have a quota but something special is coming out 01 April and I do have a month's grace so waiting until 01 April to order. I have my Su spend budgeted out now until August. Ah-HA Sharon! LOL Okay that's actually pretty good for you! Not gonna lie, that is kinda giggle-inducing, Sue! Esp after 20 years! 80 pages Janeen? At a $170 spending, that averages about $2.12 per page! Girl you go on and push that button! Read you loud n clear, Tammy! I wil look for you splurging on the 1st! Speaking of... who's hosting April? Wow Janeen!Are you going to beat Amanda to the 100 goal?? Sonja - HL sells similar sheets to the TH ones. I use a coupon when I buy a pack making them 50 cents each. I like them because they're sturdy and protect my stamps. I have OLD mini binders that I got dumpster diving when our office moved several years ago and when I go to crops I'll put the stamps/dies in the binders. I started that project for my Julie Nutting Stamps so I could grab the binder and take it our Meet Up. Now I've got too many stamps, but like that they're all in the same size sleeve. Like Sharon, it's easier to have them standing up so I can flip through. Some of my older stamps are in Avery Elle pockets, like Sharon's. I bought a cool Mermaid trunk to match my Mermaid box (where I store my Tattered Angel Mists). TMs has more sizes, but didn't get any yesterday. I LUV the pretty boxes, trunks, and suitcases and once I decide on storage furniture, then I'll put the boxes on top or on shelves. I want things grouped together, easy to grab, but also hidden in plain sight using pretty boxes. Forgot to mention hubby bought me a cute and VERY practical TH tote (similar in style to ones by Thirty-One). 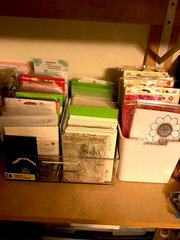 It now hold all my TH distress cardstock, stamps, stencils and embellies. Speaking of TH - I'm DROOOLING over the latest sets of Oxides. Just like I don't need more paper, I don't need more inks and mists. I think she is going to beat me to 100 pages! I am only working on page 63 right now! Of course I haven't bought anything yet though! Good Morning! Wow, the week went by fast! I am off tomorrow and today is a short day so I am grateful. Sonja, I keep my clear stamps in DVD holders, labeled and in 12x12 IRIS drawers. The TH binder looks nice and will probably take up less space. Sue, lol on the Moose... the other halves do not seem to learn. My DH keeps hitting his foot on the corner of our new bed frame that we got 2 years ago. Does it at least twice a week ? Janeen! Amanda! ... the scrapper's version of the Kentucky Derby! Tammy, looking forward to seeing what the goodies are in April. LOL girls! At the rate I'm going I should hit 100 sometime in April. I'm on spring break this week and did 4 pages yesterday... My original goal for the year was 160 pages but I also have no big plans during summer break so that means lots of time to scrap too. At least I'm starting to see some progress being made on how far behind I am. I may actually be less behind at the end of the year than I was at the beginning. Hats off to you Amanda! I don't think I could last as long as you do without buying anything! You are amazing!!! Thank you for the storage advice, gals! DVD cases! Maria that's a great idea too! DO they even still sell those cases tho???? the scrapper's version of the Kentucky Derby! Janeen it helps a lot that we have no good scrappy stores (or any at all besides M's) in our city! Sonja - I'll try to get pics posted after I finish my Secret Tag Swap. Who knows - those other boxes may end up in there too! I just need this twin to stay away from TMs. I just don't see that happening! I'm here and I blew my entire wad on the sale stuff at Catherine Pooler this morning. Birthday money and all. It felt good. Hey Kelly! Congrats and can't wait to see what you got! I've never heard of this brand and OOOHHHH the Carnivale colors are amazing! Everyone - looking to get new colors, but don't want to waste money. Can ya'll let me know which brands you like best, which clean up best, which pads last the longest? I just HAD to share this post from scrapperb2! Well, the Catherine Pooler inks are my holy grail of inks. That said, they do take a bit of getting used to. The ink pad is a very soft foam. You barely need to tap the stamp onto the pad to ink it. Also because it is a soft foam they dry out very easily, so reinkers are required. I love them though. I used to be a horrible stamper until I found these, and the colors are beautiful.